Learn how to create a Slack bot in Ruby and Deploy it to AWS Lambda. With AWS’s recently added support for Ruby 2.5, it’s easy for Rubyists to explore the world of Serverless Architecture. 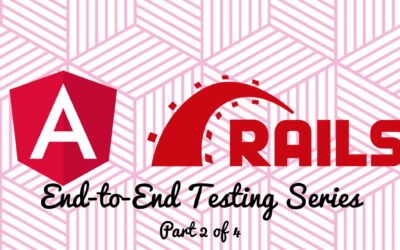 This post provides a walkthrough or setting up end-to-end testing with Angular and Rails from scratch. See the whole process, learn every step, identify and resolve every error, and ship higher quality products. What makes view specs valuable? When is a good time to write them? What are the trade-offs? This post presents a case which attempts to answer some of these questions. There are many ways to end-to-end test an application. This post is the first in a series that walks you through the thinking, code, and trade-offs of how we approached end-to-end testing in a recent project. Have you seen a cursor, jump? Maybe you’ve heard about it from a user (directly or secondhand)? Here we dive in to find out just what drives this chaotic ghost in the machine. Keydown is likely the only keyboard event we need. The others, who needs them? Not us! Okay, maybe keyup goes on the shelf just in case, but surely keypress can be tossed out. Programming can take many forms. The automation features on iOS are the next frontier of shell scripting. Learn how to use the olive_branch gem to keep JSON data consistently cased for data over stock HTTP and WebSockets connections.